Major League Baseball has started this year’s version of a popularity contest. Fans can vote online for their favorite players to represent their favorite teams at the 2014 All Star game in Minnesota on July 15, 2014. In case you are unaware of how it works, I’ll give you a brief run down of the process. Go to MLB.com’s ballot page. Each team has a representative at every position. Simply, select your choice, including a write in at the end, and submit your choices. You may do so 25 times per email address. Voting ends July 3, 2014. The real purpose of this post is to state the case for certain Toronto Blue Jays to be selected as 2014 All Stars. There is still a month of voting to go; anything can happen. But, I’ll examine who has made an early case for consideration. Currently, among the top “vote getters” are the usual suspects: Robinson Cano (726,158) leads all second basemen, Mike Trout (1,361,649) currently leads all players and Derek Jeter (1,007,968) who will be an All Star regardless of how he plays being that this is his last year; an issue I have no objection to. It should be noted that all vote totals are from Joey Nowak at MLB.com and are current as of June 2 at 11:25am (ET). Right now, there are two Blue Jays among the leaders. Jose Bautista (as you would expect) is enjoying strong support. He is currently second in the league with 1,351,896 votes. This should not come as a surprise to anyone. After all, he is the most recognized face of the Blue Jays’ lineup. He is the most common name. Yet, his play would suggest that this is a very deserving nomination. According to our friends at BaseballReference.com Bautista has played in every game (58) and leads the league in walks with an amazing 47! He also leads the league in OBP (.442). To go along with those totals, he is hitting .311 with 64 hits, 14 homeruns and 40 RBI. If you like, you can also add in his great play in the outfield. I’m sure Billy Butler and Omar Infante would attest to his defense! Each got an up close look at Bautista’s arm as he threw them out at first from right field. 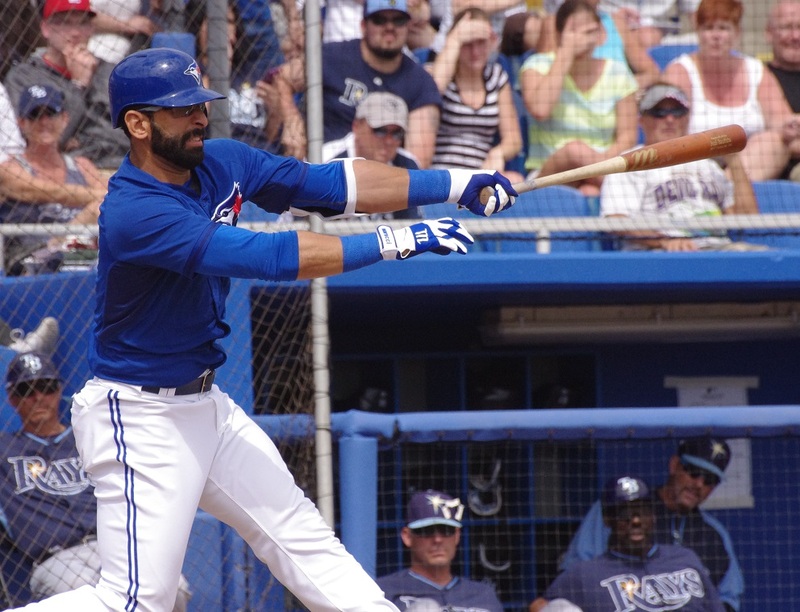 There is no doubt in my mind that Bautista will start in right field for the American League on July 15. A surprise in the All Star balloting is that Melky Cabrera sits in the third outfield spot with 743, 208 votes. Although, I am not so sure we should be surprised. He’s hitting .308 with 74 hits (in 57 games), 13 doubles, 2 triples, 8 homeruns and 30 RBI. He’s accumulated 115 total bases thus far! He has been a major reason why the Blue Jays enjoy a lead in the AL East. Perhaps fans are starting to take notice. For the record, I am NOT going to entertain ANY notion that he is not playing clean this season. He’s healthy. End of story. It would be nice to see his vote totals carry on right through to July 3rd. 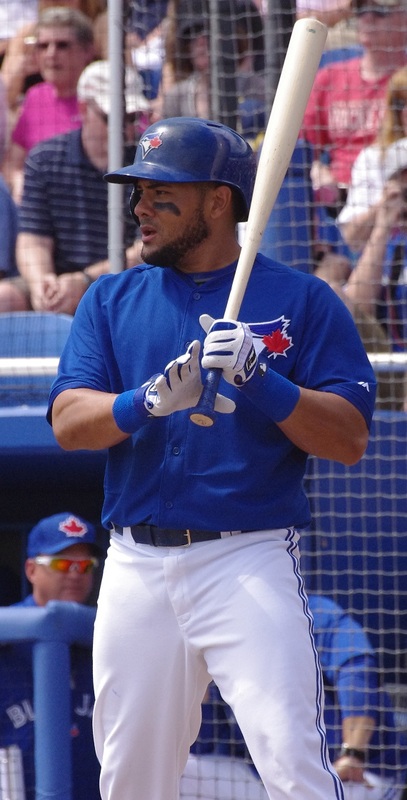 An outfield of Melky Cabrera, Mike Trout and Jose Bautista would look quite nice, no? In the early goings, it would appear that the Blue Jays will have at least two representatives at the All Star game. My point is this: there are far more who SHOULD be there. Edwin Encarnacion is on fire! He led the planet in homeruns in May (16). And, he started June off with another. His numbers are solid. Originally, I thought the problem was this: He plays first base. That would mean he would be up against Miguel Cabrera who has 962,138, not to mention Albert Pujols and his 569,211 votes. Then I saw that Encarnacion is actually listed on the ballot as a DH. While that means he doesn’t have to compete with Miggy for votes, it means that he has to compete with Nelson Cruz instead. Cruz is also listed as a DH on the ballot. It could be an uphill battle if Cruz continues to rake at the plate. Having said that, even if Cruz does get voted in as the starting DH, Edwin will almost assuredly be added to the All Star squad anyway. I’m not worried. But, it would be nice if we could have another Blue Jays starting. That would bring the total to 3. Another candidate to start as an All Star in 2014 is Mark Buehrle. He leads MLB with 10 wins. But, that is not the only impressive number for Buehrle this season. He has made every start this season (12). Considering how pitchers are dropping like flies this season, that stat is kind of impressive. But, the numbers just get better for him. His ERA sits at 2.10. In 81.1 innings, he’s only given up 19 earned runs. He’s only walked 20 batters while striking out 46. His WHIP (1.193) is his third best career total. He leads the league with 0.2 HR9 (Homeruns allowed per 9 innings). He’s doing all of this while pitching at Rogers Centre. One would think the numbers would be skewed in favor of hitters there. But, Buehrle’s ERA+ (ERA adjusted for the player’s ballpark- 100 is average) is at 198, which leads the league. The only competition I see for Buehlre would come from the Yankees’ Japanese phenom, Masahiro Tanaka. Yet, he has fewer wins: 8. His ERA is better (2.06) but not by much. Really, the most impressive difference is that Tanaka has struck out 88 batters and only walked 12 in nearly 79 innings. His WHIP is also better at 0.953. Even though Tanaka has fantastic numbers, I still think the starting nod has to go to Buehlre. If I’m choosing a starter for a game that means as much as the MLB All Star game (home field advantage in the World Series- please sense the sarcasm) I’m going with a veteran who is on fire. The hot shot rookie will get his chance; just not the chance to start. Not this year. So, that would give the Blue Jays 4 starters. Not too shabby! Since the first week of April, I have been sticking by my pick of Aaron Loup as an All Star this season. And, he very well could garner a selection from John Farrell. Remember that the manager of the previous year’s World Series teams manage the All Star game. Ever since I made the pick, I’ve been questioned, mocked and ridiculed. But, I stand by my pick. Currently, Loup has a 2-1 record and a 2.60 ERA. In 26 games (27.2 innings) he has only allowed 16 hits, 13 walks and struck out 22 batters. He has only surrendered 8 runs. His WHIP sits at 1.048. Loup had a few rough outings earlier this season. If he can continue the current groove he is in, his numbers will only get better. Look for him to join the boys in Minnesota. That would bring the total Blue Jays presence to 5. Perhaps the only other player who even stands an outside shot at making the All Star squad would be Casey Janssen. He missed a lot of time early on due to injury, but has proven his impact in a way that pure numbers cannot really show. It is like his return gave the whole team a calming boost of confidence to propel them into first place. But, let’s look at the numbers anyway. In 10 games (10 total innings), Janssen has converted 8 saves. He’s given up 7 hits, 1 walk and 6 strikeouts. His WHIP sits at 0.800. With over a month to go before the All Star game, Janssen has plenty of time to pile up the saves. Assuming health, Janssen could make the All Star team. That would give the Blue Jays 6! It has been a long time since the Blue Jays have made this much noise. They haven’t been in first place this far into the season in over 20 years! This excitement could result in several Blue Jays heading to the Mid Season Classic. While some could be chosen by the coaching staff (it’ll be interesting to see if John Farrell considers John Gibbons as a coach), fans should head to the online ballot and make some noise. Let’s vote the Blue Jays in to the All Star game. Let’s show just how excited we are about this team! Head to MLB.com’s online ballot. NOW! Follow the Blue Jays’ minor leagues? 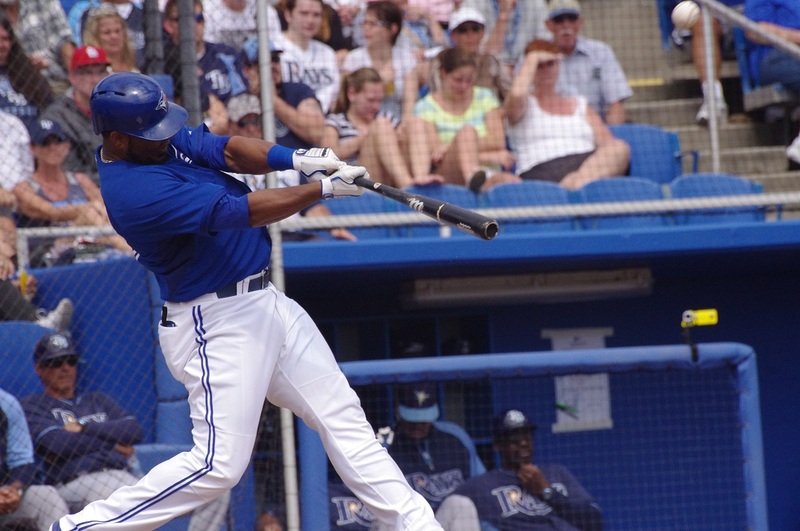 Get the 2014 Toronto Blue Jays Minor League Handbook for just $7.99 US, available at Smashwords.com. Full of information about the Jays’ minor league affiliates and their players, this e-book will provide you with team histories, travel information and profiles of over 250 Blue Jays’ minor leaguers! All photos are copyright Blue Jays from Away 2013-2014 and may not be used without permission. Where do go to vote on line I wish to vote for Edwin Encarnacion. this site where I can cast my vote! You can vote at THIS link!